Welcome matthewcriswell, I'm hoping for your sake it is the coupler, but it sounds like the rear diff went. Both issues are very common, one's a cheap fix (coupler), one isn't (diff). First thing to do is pull back the rubber boot, and see if your coupler has snapped, then you'll know. Why do either break? Unfortunately, Arctic Cat built the Wildcats with parts that were rated for quads, and quad horsepower. 2600 isn't a lot of miles, most diffs go in the 3500 mile range or so. First figure out where your damage is, if it's the coupler, no problem. If it's the diff, if I were you, I would PM (after 5 posts), Sand n Sea. His name is Robert, and he has done numerous diffs, and helped out many members (me included). There's also a sticky about diff repair too. Thanks Hollywood. After reading other posts, I found Sand n Sea's sticky post about the differential rebuild. I will definitely need that one to rebuild the differential if needed. (most likely the differential caused the coupler to break as well.) Best get to work! Any new suggestions on replacement brands of bearings or whole kits to rebuild with? 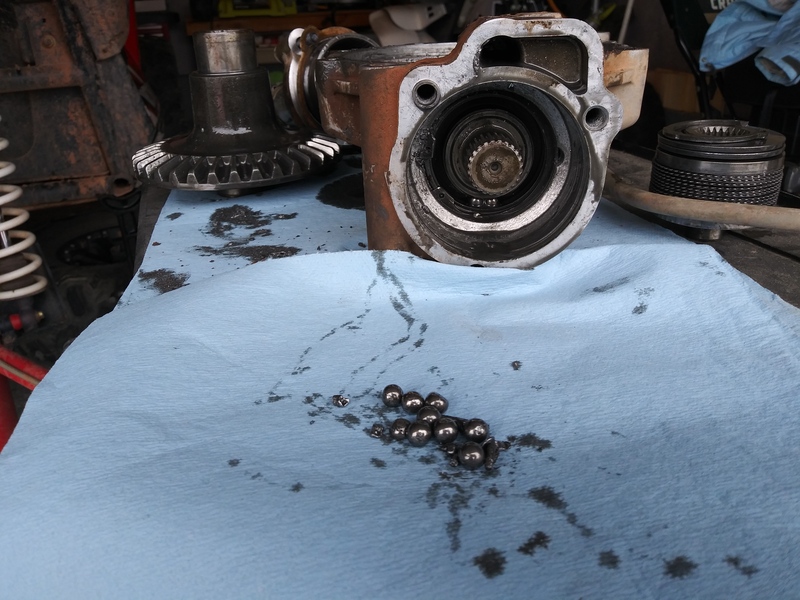 Well, I believe All Balls has the bearing set for the diff. Once again, it might not be that easy. When my diff went, the shrapnel tore up the inside of the case. I needed a new case too. Best to check everything. Getting the diff out is pretty straight forward and easy. I'm trying to remember, but after zip tying the radius rods out of the way, I think it was only 3 bolts to remove the diff. 4 at the most. Hollywood, Is it at all possible that this is a SLD issue? Being that the rear wheels did not lockup and rolled fine after loosing power. I have a hard time believing that the diff is bad at this point. If the SLD went bad... would I still loose all power to the rear wheels? The rear drive coupler breaking can be attributed to CFCS (Cheap Friggin' Chinese Steel) they do not believe in metallurgists or scrapping the waste off the top of the vat.. That along with metal fatigue will give you erratic results with the metal. The early cats had a problem with the rear drives breaking and an updated model was brought out which also has issues as well (see comment #1). The sld is a wear item that sends shock loads to the entire drive train when it slips. Check the rear drive (The SLD cartridge is accessible also) then pull the plug on the rear diff to see what comes out. Last edited by Black Cat; 04-10-2019 at 06:34 PM. Hollywood and mtgott like this. I don't believe it's the SLD. But stranger things have happened. Have you check the coupler yet? Going to dig into it this weekend. Just really confused what could have caused the coupler drive to break (if it is) yet not lock up the rear end. I just reread your last post. You could be in luck. If your rear wheels are turning freely, and not making sounds like nuts and bolts going around in a washing machine, your diff might be fine. Could be just the coupler snapped. Let us know. So I after pulling out the rear diff. 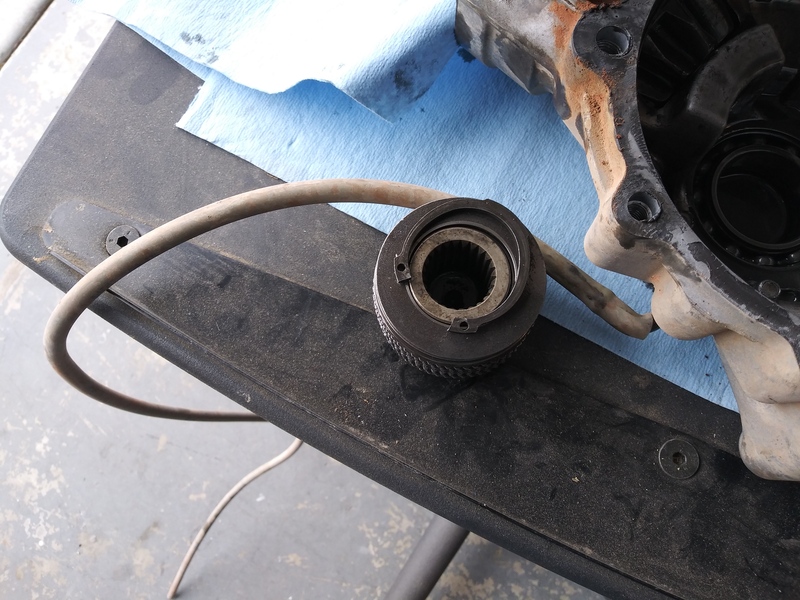 Found that the C clamp holding the SLD was bent and no longer connected, the bearing behind the SLD was destroyed and the needle bearing is also destroyed and MIA except small pieces. Good news is the rear mid coupler drive is intact and not damaged. I'll get the bearing set by All Balls. Need to find the replacement C clamp and gaskets as well. Don't think I'm going to weld the SLD while it's out. If anyone has suggestions while I have this thing apart.... Let me know. Do you grab a lot of air and land hard? If not, I don't see why ur against welding the SLD. Only 2 types of SLDs. Those that strip, and those that WILL strip down the line. Just my 3 1/2 cents. Your damage looks exactly the same as mine a couple months back. I got lucky and found a brand new diff on ebay for just under $500.00. My blown up one will make a good spare once I get it put back together. Mine failed in my pinion because the needle bearing that supports the pinion came apart and the rest followed. Tore my buddies down and found the same needle bearing starting to fail. Luckily caught that one in time. So, if I would give any advice, it would be to replace bearings every 1500 miles or so. Cheap insurance and easy enough to do. Brand new for under $500? That's well under dealer cost. Good find, maybe they just wanted to get rid of it. I also had to order a new Pinion gear, external c clip for the sld and also (of course) new bearings and seals. The pinion gear nose was completely worn just like the one on the rebuild sticky. The only difference was mine was not able to be turned down because it was so warn. it was around 13mm in the center of the nose. I feel like the needle bearing had to be gone for quite some time to cause that amount of damage. How much fluid in the rear differential?